Desktop computers from Puget Systems are of a rare and exclusive breed. Meticulously designed, expertly engineered and extensively tested, they are optimized, powerful, quiet and reliable. Our standards are second to none and you can have confidence that every component has made the cut to be in our product line. We value the Puget brand and take our approach to quality hardware seriously. At the core of every custom desktop computer system is the latest, most advanced technology available today. In a world where technology is ever-changing, we relentlessly pursue the most cutting-edge technologies in search of the best solutions. No matter what you throw at your Puget Systems computer, it will be ready for action. When it comes to reliability, we border on obsessive. We extensively test every component in our product line. We track and monitor trends in reliability rates and will not add or sell any products that we can't stand behind. What you end up with is the most reliable computer you could ever own. 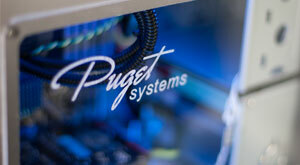 One of our core values at Puget Systems is transparency, and that's no more apparent than during our sales process. If you come to us and let us know that you're looking for a desktop PC in a certain price range or for specific uses, our Sales Representatives are open and honest with you about the best options for your target price and performance. None of our Sales Representatives are on commission, and it's our goal to get away from the hype of the computer industry while building long-term, no-nonsense relationships with each and every customer. Customize your own desktop computer from scratch. You're choosing from the best, because we only sell products we recommend and stand behind. Let us save you money! Work with our experts to find the best choices for your needs and your budget, to give you the best bang for your buck. Place your order on our secure website. Buy a desktop computer with complete confidence from our reviews and testimonials. Follow your order in real-time through our extensive checklist, and receive a tracking number by email. Most orders ship in 10-14 business days.